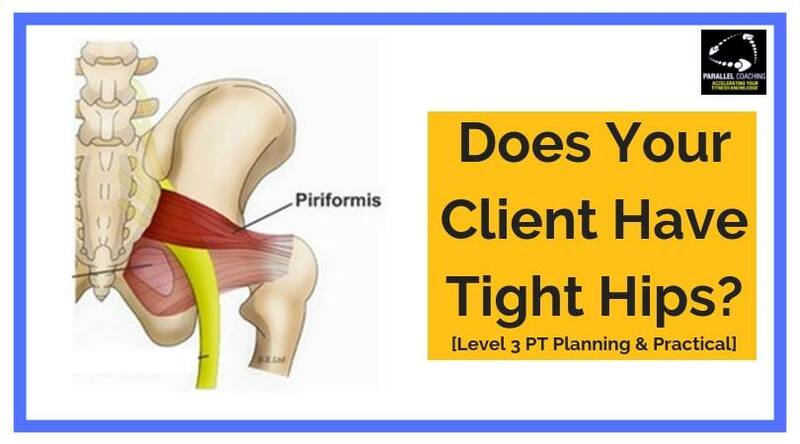 Do Your Clients Have Tight Hips? In particular the Piriformis and the External Rotators of the Hips? You can tell if your client has a tight piriformis muscle because they will turn their feet out on the eccentric, or lowering phase of a squat. There are many other tests you can do to test which muscles are tight or weak in the body. The piriformis muscles commonly get tight as a result of long hours seated in the car, sat on the sofa or in the office. The Piriformis! A small muscle that can give a lot of grief. This muscle is responsible for external rotation of the hip, and sits very close to the sciatic nerve. This means that if it become inflamed or over tight, it can put pressure on the sciatic nerve and cause “sciatic pain” symptoms. So, if your client complains of back pain or shooting pain/numbness down the leg, and they often turn their leg out from the hip (standing with feet at 10 to 2 position), then it is always worth suggesting the piriformis stretch. If your clients have tight hips then here is a stretch that will really help the Piriformis and External Rotators relax. The Pigeon Pose is a great way to stretch the piriformis if your clients have tight hips. To direct your client’s into the position start them in a press-up position and bring the right knee close to the right hand. Then encourage the client to evenly press both hips into the floor, they will feel a stretch on the hip flexor of the left leg and the piriformis of the right leg. If they are quite flexible, then they can progress the stretch by bringing the foot up, so the lower leg is parallel to the chest and shoulder. To make the stretch easier, you can lift the front leg up onto a plyo box, a bench or even a bed at home. This lifts the knees and hips off the floor and makes it much easier to get in and out of. If your clients have tight hips, then teach them this stretch and get them to hold it for 15 -30 seconds each side, 3-5 times per week. If you like this video, hit the thumbs up button, and share this with your clients that have tight hips. Thank you for watching, I’ll see you in the next video. Now that’s a fair bit to remember and the course manual provided can be tricky and hard to retain all the knowledge. That’s why we have created the Level 2 and 3 Muscle Memory Sprint. 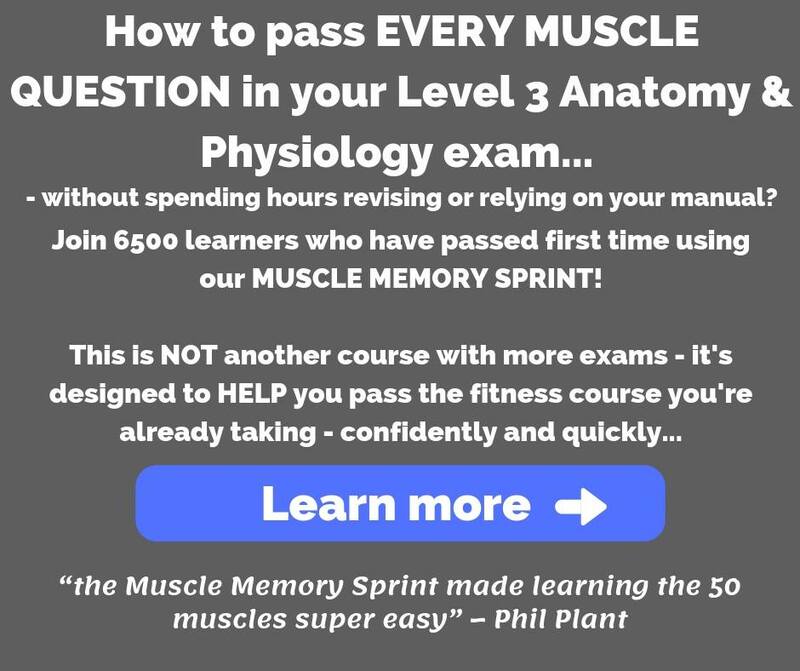 Here you get 50 Clear Muscle Flashcards that provide all of the key information that you need to know. 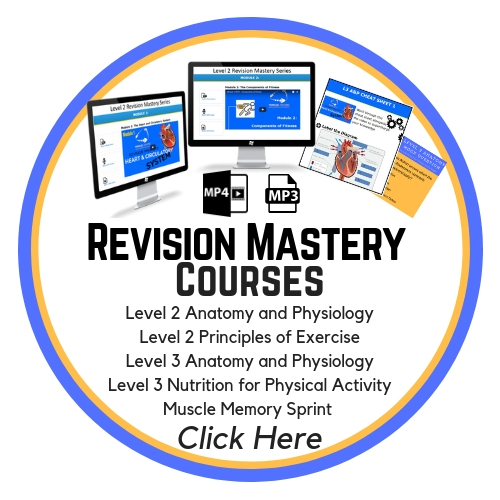 You also get 20 x15 minute MP3 Audio files and 28 Day Muscle Memory Sprint Email Series where all muscles are delivered to your email inbox, each day for 28 days to structure your learning. So it’s kinda like having a one-to-one tutor teach you a muscle every day for 4 weeks. Better than that, you can press PLAY, PAUSE, REWIND, AND FAST FORWARDS to ensure you truly understand each muscle. Further still, the Audio files can be downloaded to MP3 on your phone, meaning you can learn ANYWHERE, ANYTIME even without WiFi. 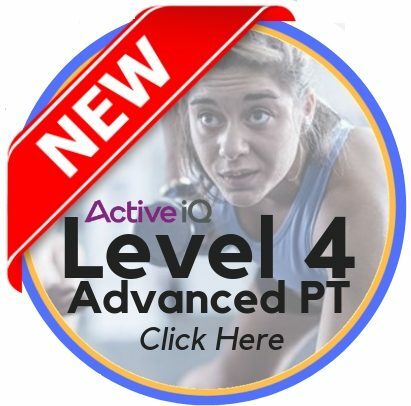 And, you get lifetime and instant access to all of the muscles through your login, so you can also learn at your pace, and return back to learn more even after passing your exams. You also get a ton of BONUSES that helps break down learning and gives you the EXACT exam day strategy that has helped over 6500 other learners pass first time. Click the link below to learn more and I’ll see you on the Level 2/3 Muscle Memory Sprint. 1. Which Joint does the Piriformis? 2. 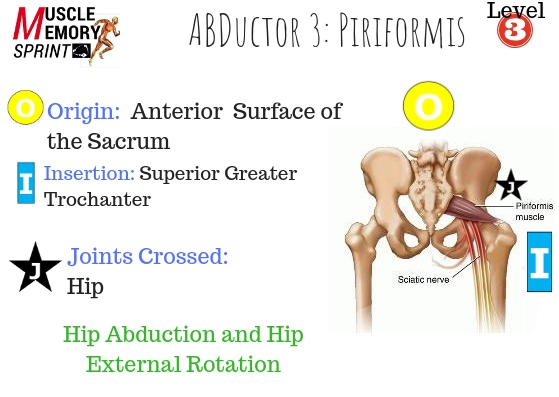 What is the Insertion of the Piriformis? 3. When the Piriformis Contracts Concentrically which movement occurs at the Hip Joint?